It was a thrilling day in early April when Dr. Linda Rozell-Shannon, President and Founder of the Vascular Birthmarks Foundation (VBF), and two active duty military personnel made their way to New York City for free laser treatment sessions with Roy G. Geronemus, MD, a pioneer in the laser treatment of vascular birthmarks. 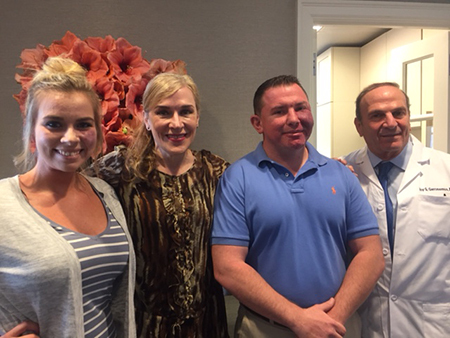 Organized under VBF’s “Pay It Forward” program, Scott Cupples of the US Air Force and Erica Ratz of the US Marines became the two most recent soldiers to receive the treatments by Dr. Geronemus at his world-renowned Laser and Surgery Center of New York. Under the initiative, VBF identifies and screens potential patients—both active duty personnel and veterans—who have a port wine stain; those who qualify may receive the free treatment from Dr. Geronemus. The normal cost can range from $500 to $2,000 per treatment depending upon the extensiveness of the procedure. “This is the least that I can do for those who are devoting their lives to our country,” said Dr. Geronemus when asked about his generous participation. Erica, who will be discharged next month and is planning her wedding in 2018, approached the session with nervous excitement. She had memories of painful treatments as a child but knew that improvements to laser technology and procedures had made today’s treatments more effective than ever before and that Dr. Geronemus was one of VBF’s most highly regarded physician experts. Scott Cupples has been receiving free treatments from Dr. Geronemus since the VBF Conference in October 2017; he has also since joined the staff of VBF as Lead Ambassador of the VBF Global Ambassador Team. In addition to his work as a VBF expert and his generosity with the “Pay It Forward” program, Dr. Geronemus is a Co-Director of the VBF Annual Conference and Clinics that are held during even years in NYC. In recognition of his outstanding humanitarian efforts, VBF presents the annual Dr. Roy Geronemus Humanitarian Scholarship to college bound students living with a vascular birthmark. “Through the ‘Pay It Forward’ program, at our conference and clinics, and other events around the globe, Dr. Geronemus treats hundreds of patients for free,” said Dr. Linda. “We are very proud of our relationship with Dr. Geronemus and thank him for his efforts on behalf of our community. He is a true humanitarian.